Two Brothers Blankets - Page 6 of 10 - Modern, Stylish, and Simple Crochet Patterns! I am a crochet pattern designer. I design crocheted garments, accessories, and home decor. One question I get asked all the time is what my crochet pattern designing process looks like, from start to finish. So I’ve decided to share it here. I’m sure many other designers do things very differently, but this is my personal process. Generally crochet pattern designing can take anywhere from 2 weeks to a month and a half, from idea to publication, to complete. Now that I am a bit more established I try to plan my designs at least a month in advance. But when I was first starting to design, I would just start whenever inspiration hit. So now that you know the general timeline, here’s how it usually happens, step by step. So I have a long list of design ideas in one of my many notebooks. Any time inspiration hits I write it down so that I won’t forget it and will eventually get to design it. This works well since I now plan out my designs a month in advance because I can just look through my list and decided which ones I want to work on next. I get inspiration from everything! When I go shopping I will see styles that I like and sometimes get ideas from them. Sometimes my family will inspire me to try something. Sometimes a crochet stitch or a certain yarn will give me an idea! I literally get inspiration all the time in so many different ways. Once I’ve been inspired and decide to start designing something in particular, I will then decide on my yarn, hook size, and stitch. I will then begin creating the sample. I start with a gauge swatch so that I can do the math to make the sample in the correct size. If it is a wearable, I usually make it in my size so that I can wear it myself and try it on as I work. If it is not a wearable I just use my gauge to determine what size I want it to be. I usually only create one sample unless I run into an issue during testing and need to re-work something. As I’m creating I take notes for each step of the process. Creating a sample usually takes me 1-2 weeks from start to finish. 3. Working out the Math for Additional Sizes. The gauge swatch is so important because it makes it super easy for me to figure out the number of stitches needed for additional sizes. That will have to be a blog post on it’s own, but I basically use the number of stitches from my gauge swatch and the measurements I need for a particular size to come up with the number of stitches I need for that size. Then I’m ready to send it to testers. 4. Typing up the pattern to send to Testers. Over the 4 years I’ve been designing I have put together a great group of reliable, easy to work with testers. It has taken me a while, and I’ve been burned a few times in the process, but I finally have an amazing group of exclusive testers. So once my sample is completed I usually snap a photo of it and request testers for it. I then type up the the pattern and send it to the testers who have volunteered and they work up their own sample of it in the assigned size they’ve been given. They look for typos, and work up errors throughout the pattern. They keep track of how much yarn they use and they take photos of their samples once they are finished. I think it’s worth noting that I could not do what I do without my testers. I make mistakes in just about every pattern I’ve typed. That could mean careless typos or full on math errors. But my testers catch it almost every time, so that by the time it gets released to the public, it’s error free and easy to follow. A big hats off to my wonderful testers! The next step is one I don’t always take, but I try to as much as possible. I have hired a tech editor to read through my pattern one last time and check for any errors or mathematical issues. This happens after my testers have returned their feedback and after I have edited the pattern. I’ve paid between $15 and $50 for tech editing services. This step usually happens sometime during the testing process. Since I create my samples in my size, most of the time, I usually model my own designs. My husband is now my photographer since we’ve moved, and I must say, he does a fabulous job. He tries to take photos from every angle and with me posing differently in each photo so that the customer can get a real feel for how the design will look when they make it themselves. We try to do photos outdoors in natural lighting as often as we can. Natural lighting and backgrounds just look so nice in a photo. 7. Last look through and creating the listing. When I’m done with photos and/or testing I add the photos to the pattern and make any other changes I need to make to have it completely ready for publication. Then I create my listing on Ravelry, Etsy, and LoveCrochet and I usually have a pre-release giveaway during this time. I share the design photo with my social media following and give them a chance to win it. This gives people a chance to see it before they buy and share it with their friends. The last step is publishing! I upload the PDF file to each of my shops and advertise it on all of my social media platforms! I always do an introductory sale the first few days of the release so that customers can get it at a great price. As you can see crochet pattern designing is quite the process! I love what I do and I love each step it takes to write an awesome crochet pattern (well except maybe the typing part). It’s hard work but so worth it when I see that someone has completed one of my designs using my pattern! I love when people share with me their projects from my patterns, because it just gives me a great sense of pride and accomplishment. I hope this helped you get an idea of the process I go through when I create each and every pattern I publish! Is this what you expected my crochet pattern designing process to be or did any part of the process surprise you? The Sassy Summer Sweater is SO versatile and perfect for summer! You can make this sweater as a long sleeve swimsuit cover-up OR a short sleeve tee! Wear your bikini under it or a tank top! Make it longer and wear it as a tunic with leggings! The possibilities are ENDLESS! I used Hobby Lobby’s Sugarwheel Cotton Cakes for my sweater, pictured above. This yarn is 100% cotton and a worsted (#4) weight. It was perfect to use for this sweater because I knew I wanted to use it as a swimsuit cover! The cotton yarn is lightweight and breathable and it doesn’t ruin the look of the sweater if it gets wet or sandy! As a crochet pattern designer, I’ve heard a lot of the good, the bad, and the downright ugly about crochet patterns. One thing I often hear is “I won’t pay for a crochet pattern because every time I do the pattern is written terribly and I end up having to figure it out myself anyway”. This makes me sad, mostly, because it is often times true when buying a crochet pattern. Anyone can write a pattern and publish it, so sometimes you just never know what you are going to get. But there are many crochet pattern designers out there that spend so much time working on creating a wonderful, well-written, easy to follow pattern for their customers. These designers rely on pattern sales to pay the bills and provide for their family. But I know how frustrating it is to pay for something and it not work. 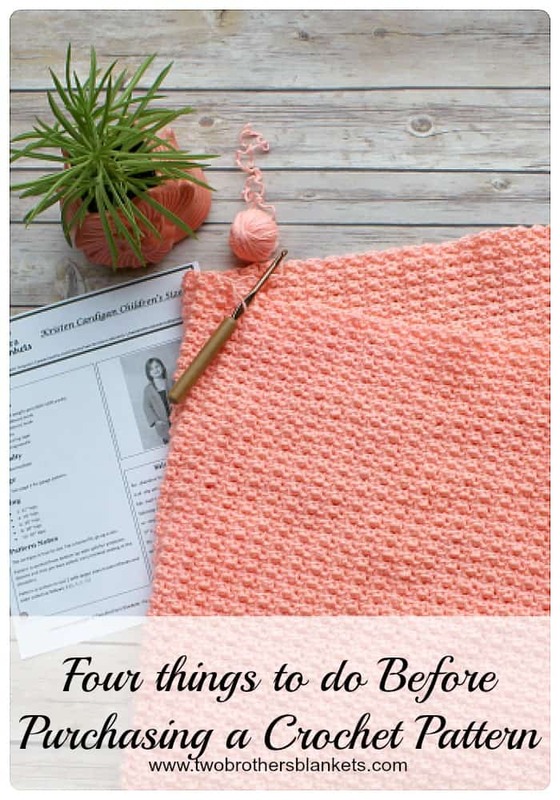 So I’ve made a list of 4 things for you to do when purchasing a crochet pattern so that you get exactly what you want and what you paid for. Most designers have links to their social media and other shops right on their listings. Before buying a crochet pattern do some investigating. Read the reviews, see how much following they have, look at their pictures, and just find out as much information as you can. If they have good reviews and a lot of people follow them and purchase from them, you are probably going to get a great pattern from them. Even if they are just starting out and don’t have many followers, you can still check the reviews, comments, photos, and more on their social media and other sites. Try a free pattern from that designer. A great way to find out if you will like the pattern you are considering purchasing is to try out a free pattern from that designer first. 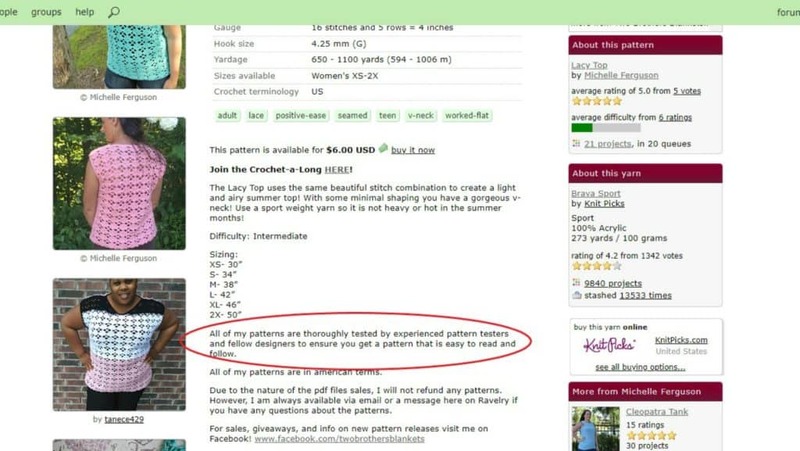 Many designers offer free patterns on their websites. Find one that you like and work it up. If it’s easy to follow with no errors, most likely a paid pattern from that designer will be in the same style and format. Check to see if the pattern is tested or tech edited. Not all designers do this, but many do. I personally think it is a crucial part of the designing process and I have every single one of my patterns tested and most of them tech edited also. This means that someone else tried out the pattern before it was published to see if they could read it, follow it, and create the intended design. Most testers also check for errors and typos while they are working on it so that the designer can fix any mistakes within the pattern before they publish it. This is a great way to be sure that the pattern you are purchasing will work up well. Many designers run sales on their patterns. I personally have a introductory sale on every new pattern I release and I often have store-wide sales during holidays and special occasions. Check social media, Ravelry, or any of the designers other online venues for a sale or coupon code before you buy. If you feel good about the design and designer after doing these 4 things, I recommend you purchase a pattern from them. You will be helping out a small business and that is a wonderful feeling. If, after purchasing a pattern, you do find a mistake or are having trouble with the pattern email the designer for pattern support. Mistakes happen. Designers are human. I’ve had patterns tested and tech edited and still found a typo in it after all that. It happens. Have a little grace and reach out to the designers. Most designers will be more than happy to help and will be glad that you reached out to them so they can fix their mistake. As a crochet pattern designer myself, I will tell you that I personally put all of my heart into each pattern I write and I truly want to produce a wonderful pattern for my customers to enjoy over and over again. I hope this helps ease your mind a bit when purchasing a crochet pattern and even encourages you to do some pattern shopping soon! What do you personally look for when buying a crochet pattern? Happy Independence Day for those of you here in the United States! I hope your day is filled with fun and family! Today marks the beginning of my Summer Stock Up Sale! 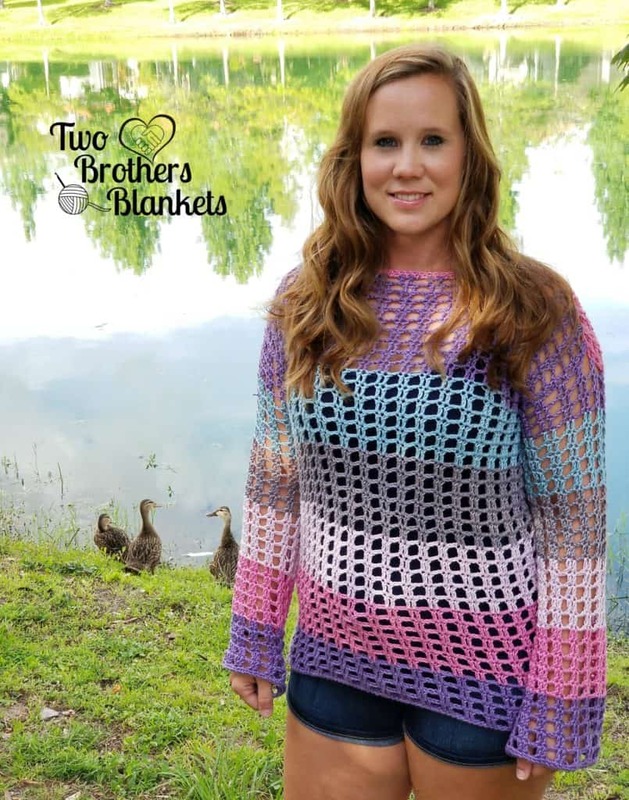 Now is the time to stock up on all of your favorite Two Brothers Blankets crochet patterns because ALL of them are Buy One, Get One FREE! No code is needed. Just add at least 2 patterns to your cart. For every 2 patterns added to your cart, one will be discounted to FREE! (Of equal or lesser value). Go HERE to shop! 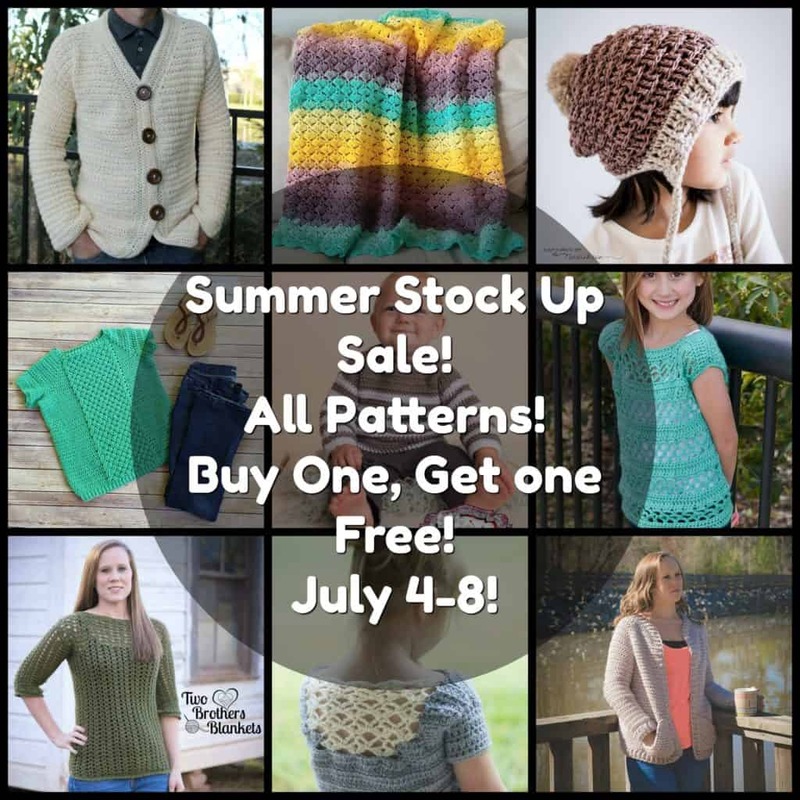 This pattern sale is good through July 8, 2018! 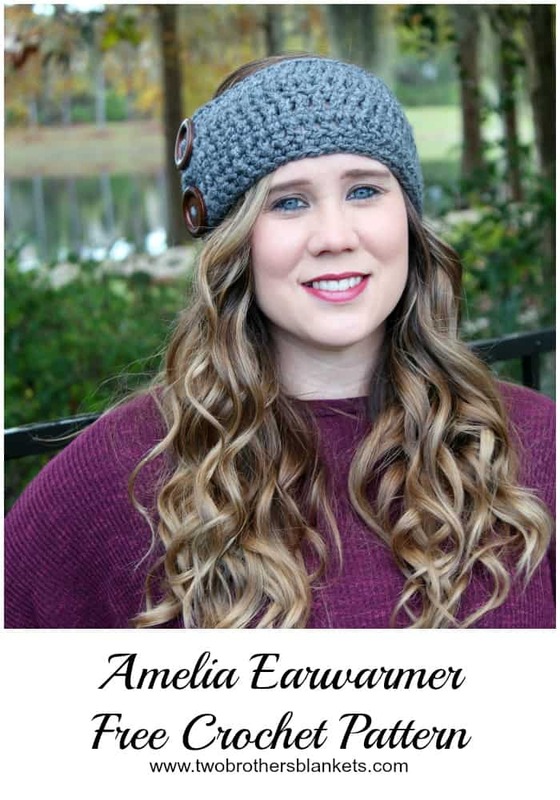 The Amelia Earwarmer was my very first pattern! It was published on Ravelry way back in February 2014! I am now offering it here on my blog for free! I used a #5 bulky weight yarn, such a Loops and Threads Charisma, for this project. I also grabbed some of my favorite large buttons for this one! You can go as large or small as you like with this project! Make it your own! You can purchase the ad-free, printable pdf on Ravelry or Etsy! One skein or less of #5 weight bulky yarn or 2 strands of #4 worsted weight yarn held together. 2 large buttons (large enough to fit very snuggly in between stitches of the wrap) – I used 1.5” buttons. For most accurate fit measure the person the head wrap will be for around the head at the forehead. Then chain until it reaches 1” less than the head circumference, slightly stretched. Row 1: Ch to 1” less than desired length, slightly stretched. Row 2: Dc in 3rd chain from the hook and continue to DC across to the last stitch. Row 3: Ch 2, turn (counts as 1st), dc in the next st and continue to dc across to the last stitch. Row 4: Ch 2, turn (counts as 1st), dc in the next st and continue to dc across to last stitch. Row 5: Ch 1, turn, sc in the same st as ch 1 and continue to sc across to the last stitch. Now sc down the side of the earwarmer, across the bottom, and back up the other side, working 2 sc in each corner. Join to first sc. Finish off. Sew buttons on to one end, one above the other, as pictured below. Buttons should snuggly slip in between DC stitches to attach the ends to each other around person’s head. Lacy Top- New Crochet Pattern! 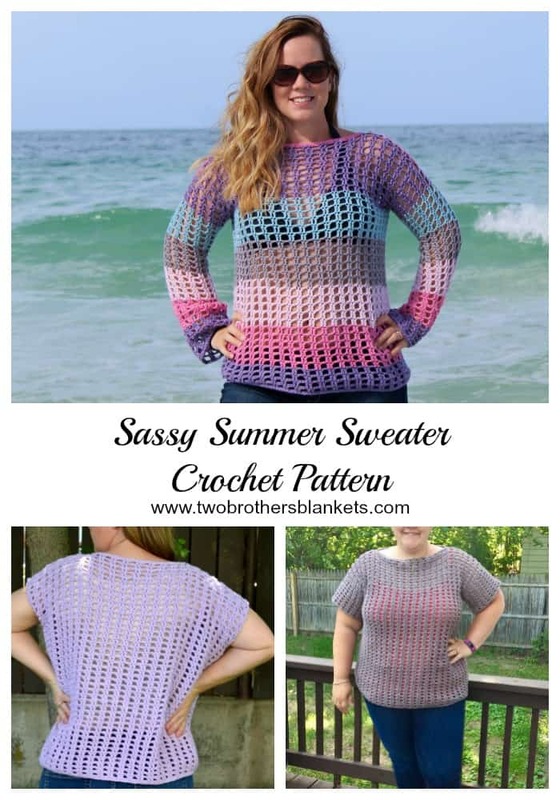 This post- Lacy Top Crochet Pattern- may contain affiliate links, which means if you make a purchase from the links below, I will get a small percentage of the sales at no additional cost to you. Thank you for your continued support! The Lacy Top is a light and lacy looking top that is great for spring or summer! It’s a very simple workup and comes with instructions for women’s sizes XS-2X. I used Knit Picks Brava Sport yarn which is my favorite sport (#2) weight yarn! It’s soft, durable, and feels very nice when worn! This pattern does require a small bit of sewing but not much. The pattern includes step by step instructions on how to assemble the top so that it is simple and easy for you! It also comes with a step by step photo tutorial for the neckline shaping! As always, I’m always available for pattern support. Just send me an email at twobrothersblankets@gmail.com! I absolutely love love love the Savannah Collection! The sweater is probably my favorite design to date! The texture in these patterns in amazing! So, of course, I continue to create more designs to add to the collection! This time I’ve created a handbag! Creating this lovely handbag was way out of my comfort zone because I’m usually making garments or blankets. I’ve only created market, slouchy type bags before. But the end result of this bag was just magnificent! 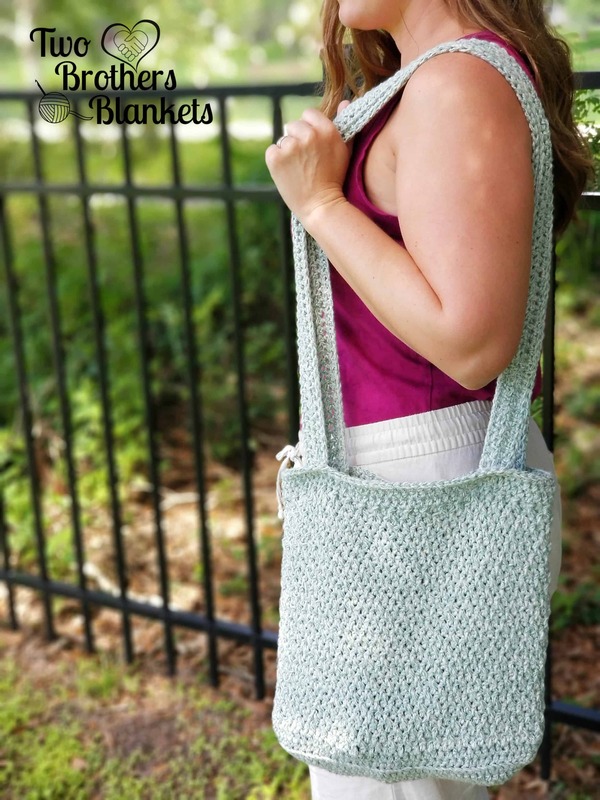 I was so proud and excited to complete the Savannah Handbag and have it tested! 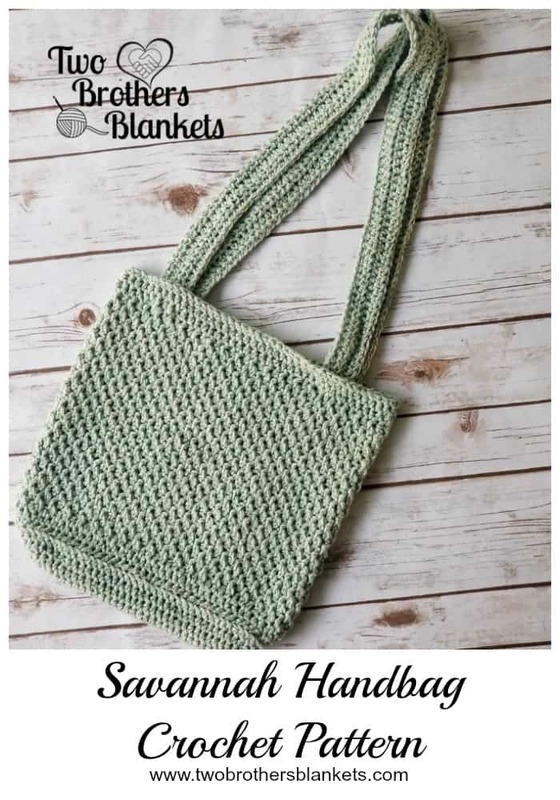 For the Savannah Handbag I used Hobby Lobby’s Yarn Bee Denim in Color yarn! This yarn is a worsted weight yarn that is 50% acrylic and 50% denim. It is very sturdy and doesn’t stretch too much, making it great for this sort of project.